Roller skating is a sport, an art form, a lifestyle, and a culture. It is the perfect way to combine fitness with fun and helps people develop a fitness habit with a sport that is enjoyable for all ages. Students of K.R. Mangalam World School, Vaishali participated in ‘All India Inter School’ held on December 14, 2017 with full zest. 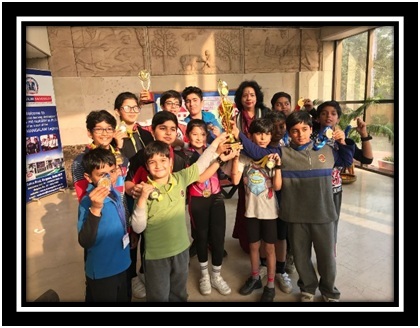 Through their exemplary performance they not only dazzled other participants but also the judges and proved their mettle on the rink once again by bagging various medals in all categories. These skaters were also crowned as the ‘Ultimate Winners’ when they held the ‘Second Position Trophy’. Kudos to the winners!